October 3rd, 2018 – 2018 looks to be a slightly better year for Scaleup Italy. In the first six months of the year, 23 new scaleups (more than half of the ones tracked the entire year before) were added to the count, bringing the overall number of scaleups over 200. More interestingly, $335M of new funding was raised in the first semester, about the same amount of capital raised in the previous 12-month period. Yet it is not enough: the Italian ecosystem still ranks 11th in Europe, right behind the Netherlands, Finland and Denmark. Among the Southern European Countries, Italy ranks 2nd behind the sole top-player of the region, Spain. Spanish scaleup were able to raised more than $3.2B, which is almost 2.5 times the capital secured by Italian companies. The gap with the major European ecosystems is now too wide to be filled, unless it is urgently needed through significant investments in innovation. 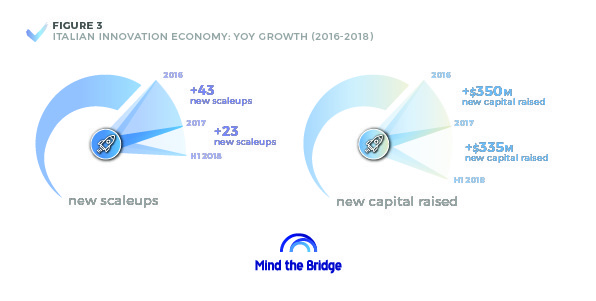 This is the main message launched by the new “Tech Scaleup Italy” Report realized by Mind the Bridge in collaboration with AGI and presented today in the opening day of the EY Capri Digital Summit moderated by the Director of AGI Riccardo Luna. In the first six months of the year, 23 new scaleups (more than half of the ones we tracked the entire year before) were added to the count, bringing the overall number of scaleups over 200. Italy ranks 8th for number of new scaleups (UK ranks 1st with 246). More interestingly, $335M of funding was raised in the first semester, about the same amount of capital raised in the previous 12-month period. 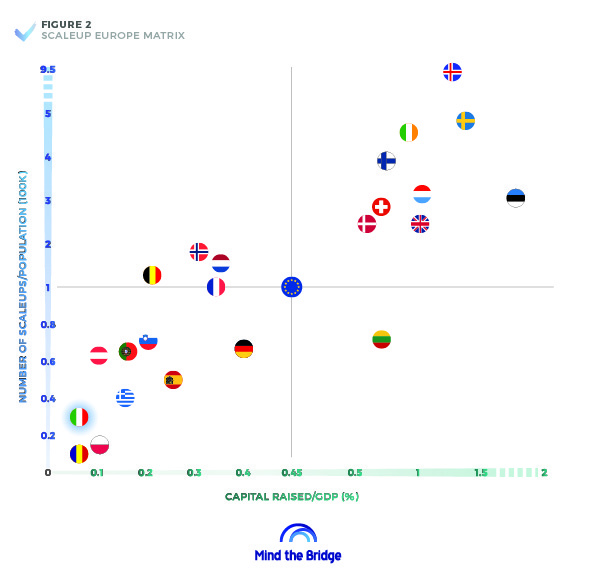 Italy ranks 8th for capital raised (UK ranks 1st with $5.9B). Among the top funded companies in 2018, two dual companies headquartered in the UK: Moneyfarm, the fintech company disrupting investments, raised $53M from Allianz and others, while Depop, the creative community marketplace, attracted $20M mainly from Octopus Ventures. This data suggest that the progress we recorded in capital raised is mostly driven by foreign investments rather than domestic ventures. In Italy the 67% of scaleups have been established between 2010 and 2014, and 13% after 2015. Only the 205 has been established before 2010. It means the Italian ecosystem is definitely younger than the European average. 60% of them completed their last funding round in last three years period: the misalignment between the year of establishment and the year of last funding suggests that Italian scaleups take some time to get access to significant financing. As of December 2017, out of the $1.3B capital cumulatively raised by the Italian scaleups, 88% ($1,150M) comes from VC funds. Stock markets (read IPOs, all – except for YOOX – completed on the AIM, the Italian alternative market focused on SMEs) contributed for 11% ($150M), while only $15M was raised through ICOs. 4 new ICOs occurred between the end of 2017 and the beginning of this year, the largest one being Aidcoin ($16M). Another interesting emerging trend is represented by SPACs (Special Purpose Acquisition Companies), a recent successful application being Archimede Spac that raised close to $55M in May 2018. Less than 1 on 2 VC investments (43%) into Italian scaleups come from domestic investors. US is the main investors outside Europe (20%) followed by from Great Britain (11%), and other European countries (2%). 17% comes from the rest of the world (the remaining 7% is note declared). 86% of the scaleups have raised less than $10M, securing 33% of the total capital made available to Italian high-tech companies. Only 12% have raised between $10M and $50M, attracting 35% of the total capital. Only the 3% raised over $50M. 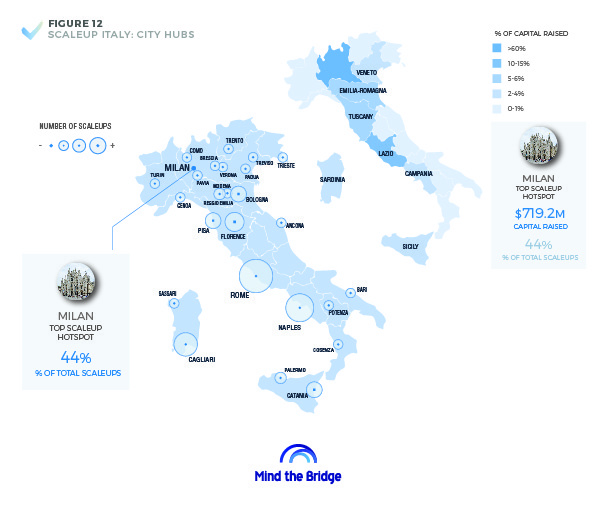 The largest hotspot is Milan, with 78 (44%) of scaleups, and not Rome (with only 12 scaleups, 10% of the total). The concentration in the top hotspot is lower than in other countries (such as the UK, with 69% of the scaleups in London, and France with 72% in Paris). A large portion (55%) of Italian scaleups is scattered across several cities, including Naples, Florence and Cagliari, Bologna, Turin. The Italian scaleup landscape is clearly dominated by E-Commerce companies (27, 15% of total), raising the largest percentage of capital ($160M), surpassed only by Fashiontech companies, whose figure is highly biased by the Italian-born, multinational company YOOX/Net-a-Porter (that alone raised $191M). Fintech follows in the rank with 18 scaleups tracked that raised $122M altogether, $80M of those raised by Moneyfarm only, the dual company that started in Italy and then moved to London. Third place for Digital Media, with 15 scaleups and $71M raised. On the “sell side”, with 193 exits of its own, Italy ranks 7th among European countries together with Switzerland in the M&As market. This confirms how Italian tech companies attract the interest of international buyers. The gap with the UK (2,544 exits) as well as Germany and France (volumes 4 times higher), again, looks too wide to be bridged. Looking at M&A data per cities, no Italian hub is in the top 10. Milan ranks 14th, with 65 exits and 60 acquisitions. Rome follows at the 20th place, with 31 exits and 16 acquisitions. These figures help to better qualify the difference between the two main Italian hubs. Beyond having a larger and more mature startup ecosystem (it produces over 2 times more exits), Milan can leverage a more developed industrial ecosystem. Companies in the Milan area acquired 60 startups in the analyzed timeframe. This is almost 4 times more than the acquisitions (16) completed by corporates based in Rome. The Rome’s “negative M&A balance” (i.e. where the number of startups that have been sold is larger than the number of startups that have been acquired by companies in the region) is typical of emerging ecosystems. Scaleup Norway: Now or Never. Innovation in CPG: more Data or better Experience?